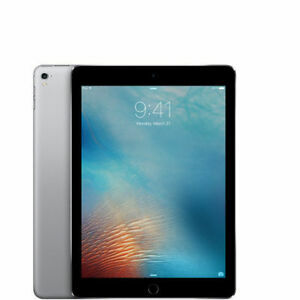 The Apple iPad Pro Tablet sports a 9.7-inch retina display with a resolution of 2048x1536 pixels and True Tone display. Powered by the A9X chip, and M9 motion coprocessor, it provides high speed and efficiency. This Wi-Fi model has a storage capacity of 32 GB, and runs on the IOS operating system. It features a 12 MP iSight camera, allowing you to capture sharp and detailed photographs. In addition, this tablet supports the Smart Keyboard and the Apple Pencil, and is available in space gray. Immediate payment of C $415.99 is required. Size is great for the mobile user. Good balance with the mobile essentials: 1. Battery life between charges 2. Weight, relates directly to user - fatigue, 3. Screen size, good ratio of eye appeal and hands movement. Holding it & viewing the thing is very important! Overall, I like the size much better than the "13 incher", and forget the thin notebooks for use in everyday running about. Go with the iPad Pro 10 inch! I couldn’t have made a better choice to buy this iPad. Going from an iPad Air (1st gen) to the iPad Pro 9.7in is a huge game changer. My apps that were running slow on my iPad Air are lightning fast again. Even the apps that I didn’t think were running slow are so much faster now. I love the Touch ID sensor instead of typing in a passcode every time. The 4 built in speakers sound amazing even at full volume. The only thing that I’ve noticed that I don’t like is the application dock will be misplaced or completely gone sometimes when coming back from a landscape app. You have to restart the iPad to fix the problem but it always happens again. It’s definitely iOS 11. I did some research and other people who have iOS 11 on their iPads are experiencing the same issue. I would’ve given it 5 stars if it weren’t for that bug. Other than that it’s an amazing product! I’m very happy with this purchase! It was a bit over priced seeing as how I paid $289.00 and a brand new one is only a couple hundred more. This is very close to brand new quality though! I haven’t really tested the battery yet as I keep it plugged in when I’m using it. A habit I picked up when using the iPad 2 I replaced. As of now, I would buy it again! Looks and works great! Runs fast and has an incredible display. Never stutters during gameplay. Price point created a phenominal bang for the buck. I love the size of the 9.7" iPad. Wanted the pro for the superior processor, display and split screen capability.